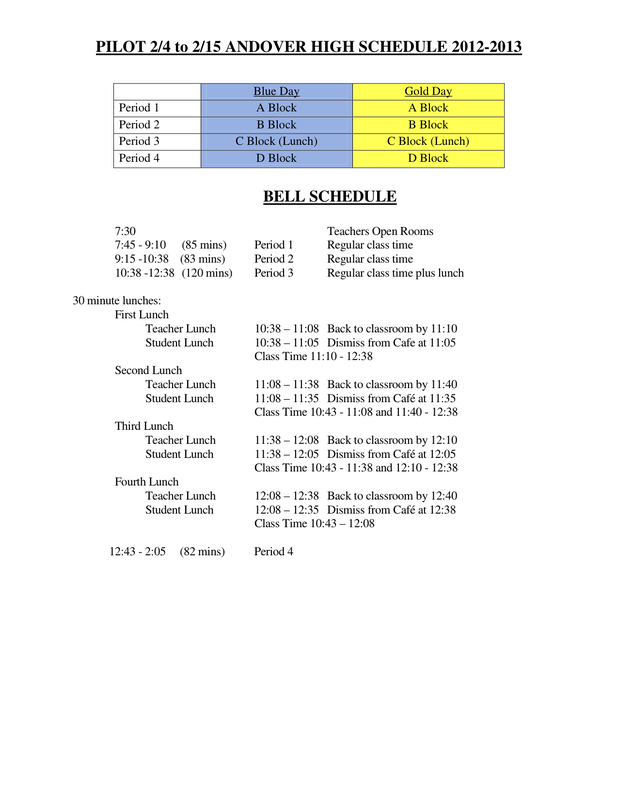 The new bell schedule for second semester. system. The new system will be in effect for two weeks until February 15th, and if successful, will remain in place permanently. Third block will remain the same length, from 10:38 a.m. to 12:38 p.m. Students will continue to have five minutes to return to class after lunch. However, there will now be a three-minute break between dismissal and arrival times between each lunch period instead of the usual nine. Students leaving the cafeteria and students going to it will be allowed in the hallways simultaneously for two minutes between periods. Another problem was that the three-period schedule violated fire hazard standards. “There’s a legal limit to the number of people you’re allowed to have in a space,” said Dr. Lord. “The code is 450.” With enrollment in AHS currently at about 1800 students, the old schedule could not conform to this law. Previous Previous post: The Easy Way Out? Thank you for taking this step to improve the dining experience at AHS. We now have a more pleasurable one for our students. The school nutrition department welcomes the change; the benefit for our students is fantastic. Shorter lunch lines, cleaner cafeteria, and at last a seat for all.